I have always been a big reader ever since grade school. In my young adult days I enjoyed mystery and romance books. In my twenties I moved onto Star Wars novellas, which probably sounds odd for a young woman to be reading. But once I became a mom, I had less time to read. By the time I had our fourth son, I just flat out stopped reading. With four children under five, um yeah there was not enough time for me to go to the bathroom, let alone read a book. It was not until I got my Kindle Touch this past November that my love for reading was reignited. I forgot how much fun it was to get completely lost in a good book. I immediately got caught up on the latest Star Wars series and read 8 books in 5 months to finish it out. In between there I read The Hunger Games Trilogy, which only took me four days to get through. See when the book is that good, I have a hard time putting it down. And having it on the Kindle makes it that much easier for me to tote around with me. My husband quickly started to dislike said Kindle because my spare time was being devoted to reading and not him. And then Fifty Shades of Grey came along and all of my time period was devoted to reading. I couldn't put that series down and finished it in three days. And now my Kindle obsession has grown to downloading tons and tons of free books. Often, Amazon has promotions to download select eBooks for free. I started following Pixel of Ink blog where you can find at least two postings a day of free Amazon eBooks. I usually download several books a day thanks to this site. I have no idea when I am going to read them as I now have hundreds of books, but they are free so why not? I will get to them eventually. 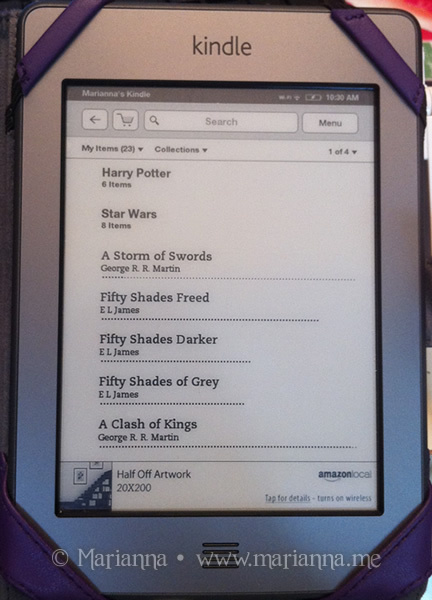 Who else out there is obsessed with their eReader? How has an eReader made reading easier or better for you? What are you reading right now? Hah! You totally crack me up, Marianna. I can't belive you've read Greys four times already with no signs of slowing down!!! I applaud you on being able to breathe with 4 young kids at once, let alone read!!! And funny, I was the same way. No I didn't pop out 4 kids, but I used to be a voracious reader and at some point stopped. But I recently got a Kindle Fire and am addicted again. I blew through The Hunger Games and am now loving the Game of Thrones series. I just finished the second one and am about to start the third. Great stuff! I got a Kindle Fire in February for the purpose of reading and have only read ONE book on it! But I've used it to watch Netflix a lot.